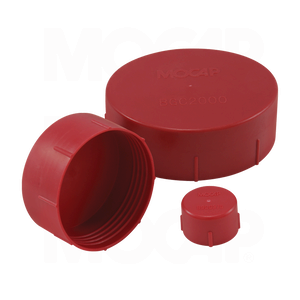 MOCAP Threaded Plastic Caps are designed for use on British Standard Pipe (BSP) threads and fittings. These Threaded Plastic Caps are knurled for easy application and handling. Protects threaded components from moisture, dust and damage during production, shipping and storage. They can also be used as masking caps during painting and plating operations. Our BGC Series Threaded Caps are molded in Red polyethylene plastic and sized to cap BSP/Gas Fitting threads from 1/8-28 thru 1-1/2-11. MOCAP stocks Threaded Caps for BSP/Gas Fittings in many sizes for immediate shipment.